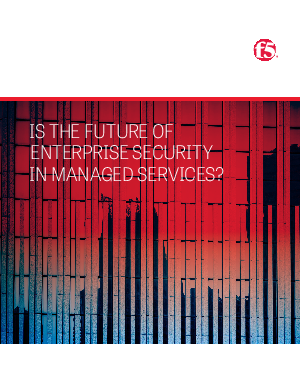 > White Papers > F5 Networks Inc > Is the Future of Enterprise Security in Managed Services? Is the Future of Enterprise Security in Managed Services? In a world where IT has become increasingly complex, cyber threats are unrelenting, and the cost to mitigate is becoming overwhelming, organizations are reconsidering the DIY approach to security and embracing the idea of outsourced security services. And while there are caveats to outsourcing security services, many organizations are reaping the OpEx and CapEx benefits while freeing themselves from becoming in-house security experts - refocusing on their core business. Read the whitepaper to learn more.